I have been lucky enough to receive a couple of products to show you from Two Fat Doves on Etsy. As you can probably tell from the content on this blog, I'm fairly selective when it comes to the type of shops that I feature - they need to fit my theme - I.E be something that I'd actually buy myself. I'd definitely purchase from Two Fat Doves - I'm very impressed with the two items that I have. It's worth noting that you are able to pick and choose in regards to trims, fabrics and shapes when it comes to the actual lampshades. I received a lovely 20cm drum lampshade in a grey and white blossom design. 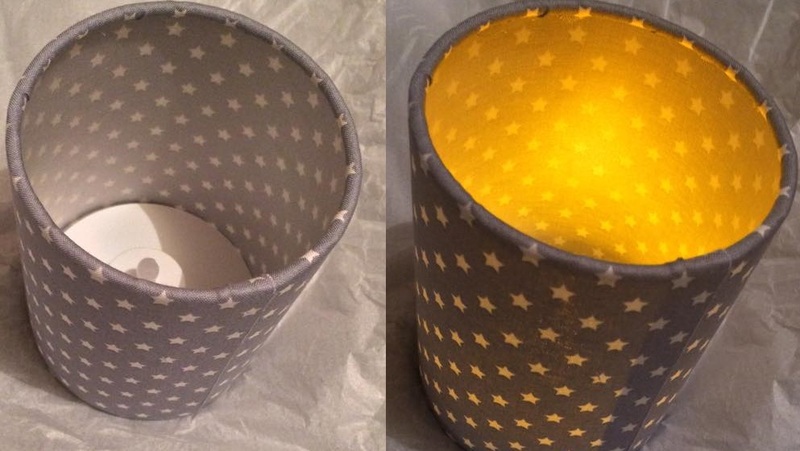 The outside is fabric with rolled edges, and the lampshade has a white pvc inner. Low energy bulbs are recommended for use with this shade and I'd agree with that. I love how this looks, it's very Laura Ashley-esque and it will match the grey décor in my living room perfectly. I'm in love with my pretty lampshade, I can't wait to find a lovely vintage look lamp to use it on. I also received this cute little lantern to show you guys. Please note that this is designed for use with electronic tealights - not actual candles! The inside is also pvc lined like the lampshade which is a cool feature. This looks absolutely gorgeous when the lights are off. I love the stars design - it reminds me of Cath Kidston. This can also be used as a makeup brush holder, pen pot etc as it has a base to it. So it's multi-use which is always a good thing. Check out Two Fat Doves on Etsy and Facebook. They have some amazing lampshades on offer at such affordable prices, it's definitely work a look.